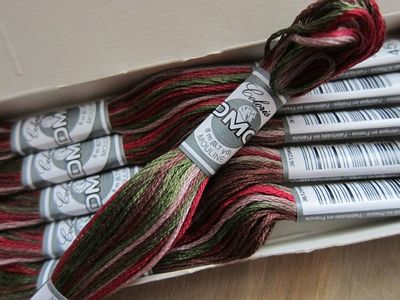 DMC Coloris Embroidery Floss. 6-strand Egyptian cotton embroidery floss with four, beautiful and complimentary shades of DMC Floss in each skein. "Introducing Coloris, DMC's newest thread. This gorgeous 6 strand floss is made from 100% cotton and features four DMC colors in a single thread. The color palette of every skein is carefully designed to be complimentary�creating a rich, harmonized look. This thread will truly give your embroidery project a unique design. Available in 24 beautiful multi-colored shades."